According to Lenin, Putumayo was once the most dangerous and most active zone in Colombia for guerrillas and cocaine production. It’s also very religious, and our host, Monica, was possibly the most devout person we stayed with. She didn’t have a job, but she spent more time at her church than most people spend working. Monica lived in a small apartment just a block from Puerto Asís’s main square with her 10-year-old sister, Carolina. Their mother lived in another apartment around the corner and was also very religious, but subscribed to a different religion than Monica. They were all very nice and welcoming to us, and Carolina and Monica shared Monica’s bed so that Lenin and I could sleep in Carolina’s bed, which was tucked into a corner of the kitchen. 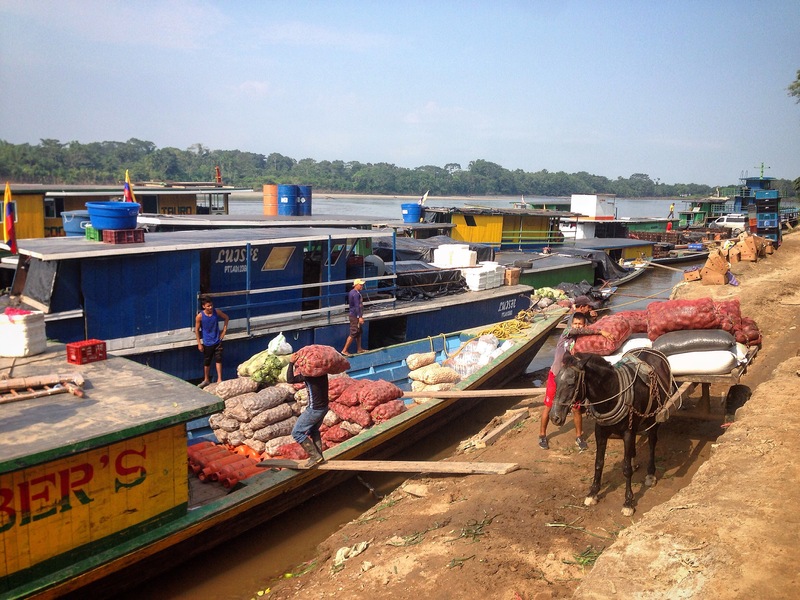 When we arrived in Puerto Asís, we had a vague idea of trying to hop on a river boat to the Amazon. It was Wednesday night. On Thursday, we walked with Carolina to the nearest dock to ask about taking a boat. The walk was inky about fifteen minutes, but it felt like we had walked to a completely different country. After a stretch of nothing but guava trees were houses of a simple wooden construction between the dirt road and the river. They were decked with banners advertising Colombian lager, and the ambiance was more Caribbean coast than jungle. Our options for taking a boat seemed limited. There was a passenger boat that we could pay $100,000 each to take us to another town in one day, but then we would have to get onto another passenger boat (for who knows how much $) to take us the rest of the way to Leticia, the capital of the Amazonas. That second boat would take about 5 days or so to get there. Our other option was to go to the bigger dock on the other side of town and inquire about hitching a ride on one of the larger cargo boats. 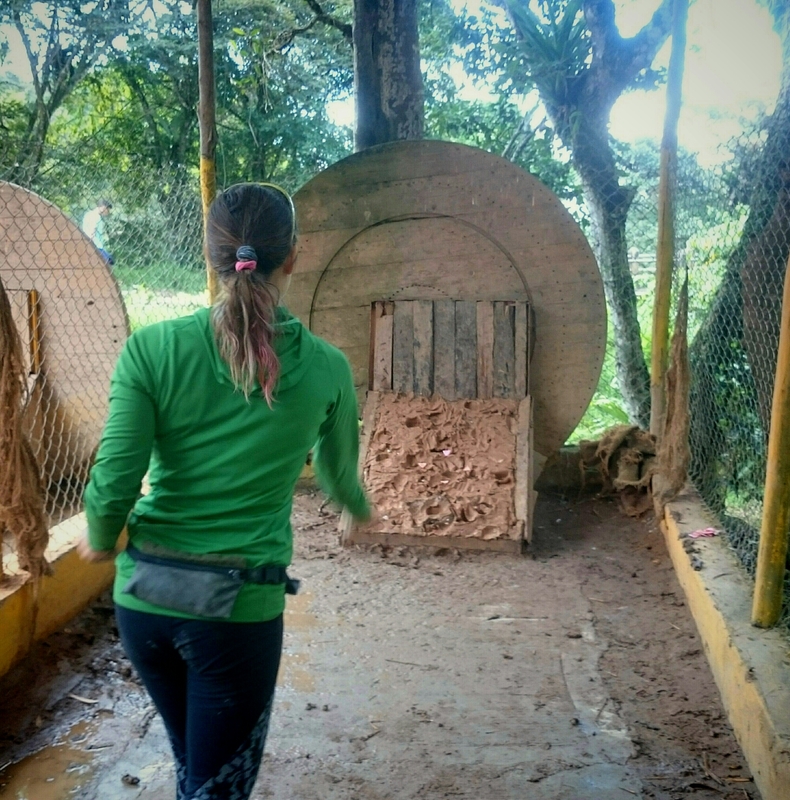 These were slower, however, because they stop at the small villages along the way to unload and load stuff and could take anywhere from 2 to 4 weeks to get to Leticia. We borrowed Monica’s motorcycle that night to get to this dock, which was a bumpy ride down a long dirt road. We arrived just around sunset and saw three large cargo boats at this dock. After asking around, we learned that it would be hard to get a ride with a cargo boat without a special license or certificate to work on a boat, but it was not impossible. One person told us that sometimes the owner of one of those boats will take passengers, but it really isn’t allowed, and there are quite a few control points along the way. Since none of the owners of the boats were actually there at the time, we had to come back the next day to speak with them. Workers load the cargo boats using horse-drawn carts to move heavy sacks from the truck to the dock. The next morning, we packed up our belongings and rode our bikes to the big dock. It seemed to be faster and easier to bike there than it had been by motorcycle. We spoke with the owner of one of the cargo boats, who informed us that he could only allow us to ride with them if we first got permission from the navy, or someone in charge of fluvial transportation. So we rode a short distance to where several naval officers were standing guard and inquired with them about getting permission. Their captain explained that we actually had to go to an office near the airport to ask the fluvial inspector. When we went there, the security guard informed us that she was in Bogotá until Monday. That afternoon our duck died. He was never quite strong enough to hold his head up, and feeding him was a challenge since he hardly ever opened his mouth. He probably would have died sooner if we hadn’t tried to rescue him, but I still felt like I had failed him. I didn’t want to give him a name until I was sure he would survive, so it wasn’t entirely unexpected that he didn’t make it. We threw him to the river behind Monica’s house, and he made some vultures happy, at least. We decided to hang out in Puerto Asís for the weekend and try to get permission from the fluvial inspector on Monday. Meanwhile, I had received news that I was accepted to take part in a documentary called Project Y, which I had applied for while we were in Fusa. 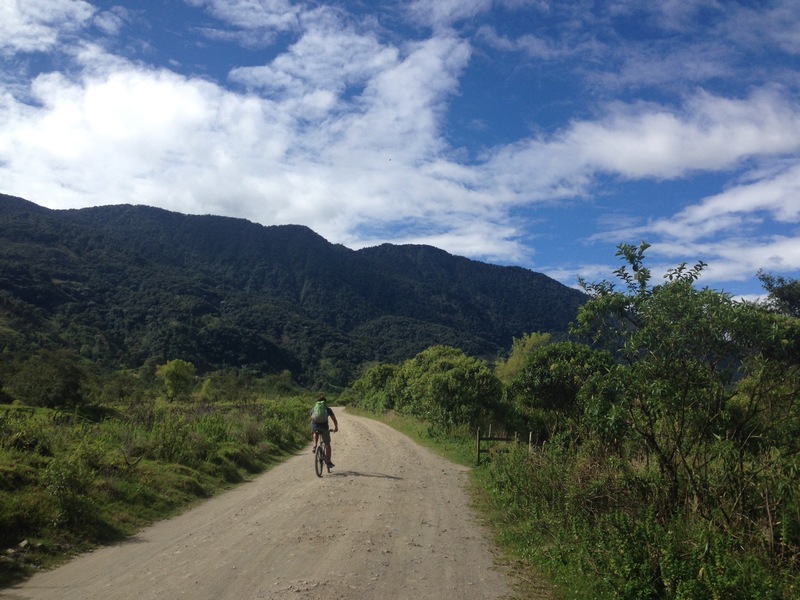 This documentary is investigating what makes people do crazy things, like ride their bikes hundreds of kilometers around Colombia, for example. More specifically, they were looking for endurance athletes who appear to have an appetite for torturing themselves via extreme physical challenges. Apparently, I fit their requirements. The first step in participating requires all the athletes to meet in Portland, Oregon for an evaluation, to receive equipment (including a new bicycle! ), and be given individual goals and personalized training plans. 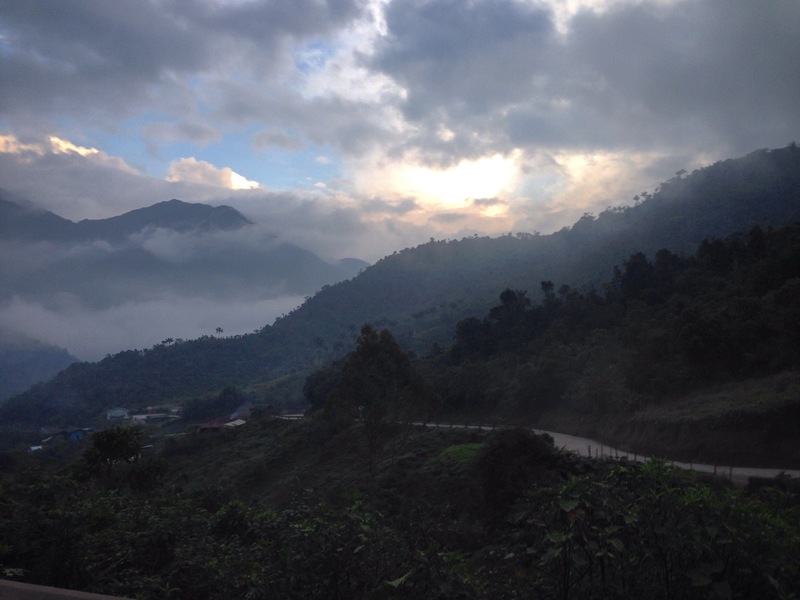 It meant that I would have to leave Colombia at the end of March instead of the end of April, as we had planned. This did not make Lenin happy, and while I was ecstatic to have been given this opportunity, the mood of our journey was never quite the same after receiving this news. 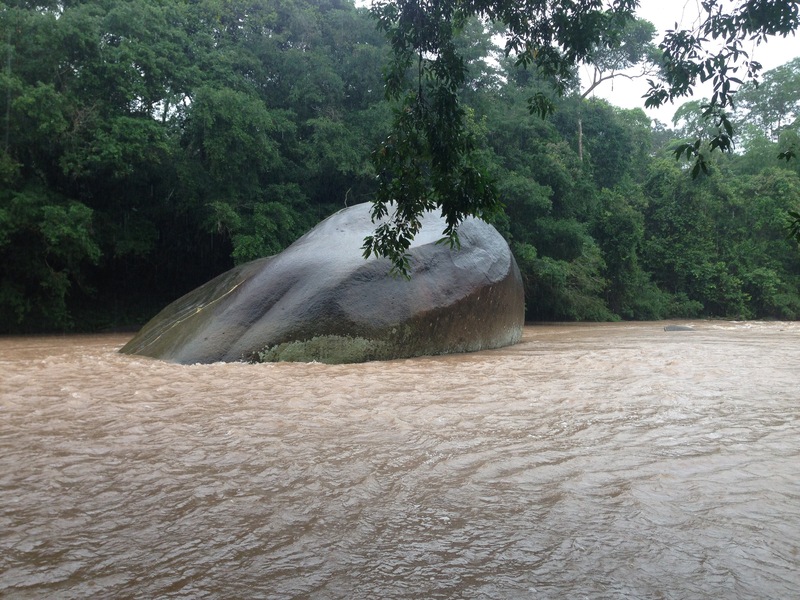 We only had a month before I had to board a plane, and spending three weeks on a cargo boat may not have been the most appealing way to spend my time in Colombia. I also had to either leave the country by March 14th or ask for an extension to stay longer, since my tourist visa only allows for 90 days at a time. I still thought the experience of riding a cargo boat down the Amazon was worthwhile, and I could fly to the US when we got to Leticia. 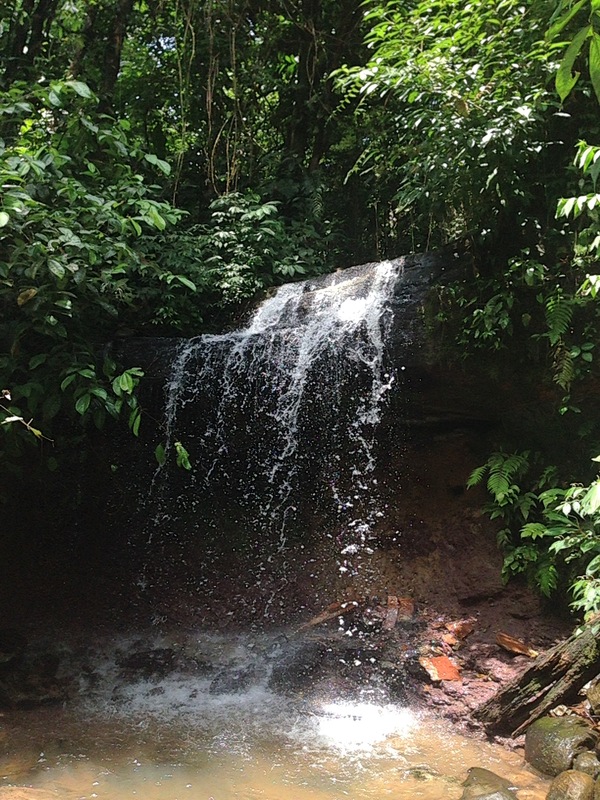 If we couldn’t figure out a way to make the Amazon trip work, we would continue south to Ecuador. We totally weren’t planning on staying more than a night or two in Puerto Asís, but Monica and her family were happy to have us. We cooked all our meals in their abandoned kitchen, using up whatever food would have otherwise gone to waste. We tried to share with Monica, but thanks to her religion she was fasting for a month and could only eat one piece of fruit after sunset each day. Lenin taught me how to scale and clean a fish, and then proceeded to clean all of the fish he brought home while I worked on one of them. Lenin does everything fast, but I could use more practice for sure. Kids from the nearby school surround me and bombard me with questions. On Monday we rode back towards the airport to talk with the fluvial inspector. The street was blocked off a block or two before we got there, and we learned that the president was in town, meeting with one of the last guerrilla groups for negotiations. We were still able to bike through, and upon arriving at the office, a group of school kids surrounded me, sensing that I was a foreigner. They bombarded me with questions, tried to speak English, and asked me to speak English. It seems that everywhere I go, outside of major cities, the children are fascinated by me. It makes me very self conscious and uncomfortable, but as they keep questioning me, it gets easier. I imagine that these kids in Puerto Asís were more interested in taking to me than they were in meeting the president, or at least it was easier for them to get close enough to talk to me. They invited me to come to their school and talk the next day. Apparently, the English teachers in most schools are not native English speakers. When people hear a real foreigner who speaks English, it is enchanting. They want to listen to us speak, or ask us to look at their homework assignment for them. During my time in Colombia, I have corrected a fair number of class assignments or projects people were working on in English. 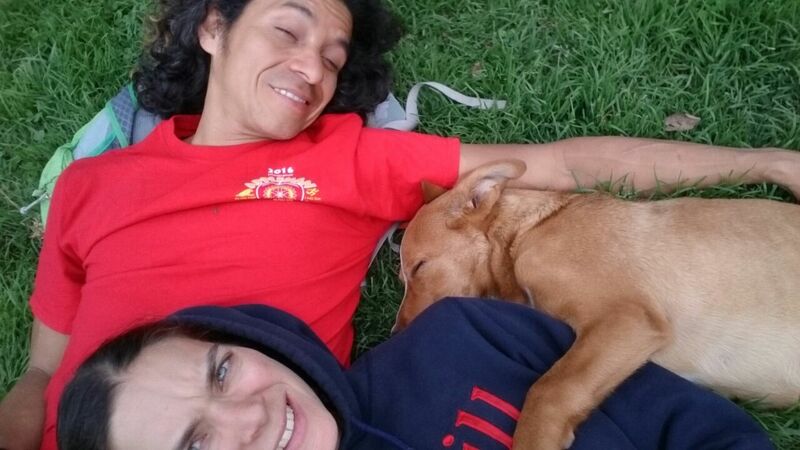 Anyway, when we finally met with the inspector, she told us that she could give Lenin permission because he is Colombian, but I would need to have a work visa in order to be granted permission. Without a work visa, I would need a visa to enter Brazil, which, for Americans, is not a quick or cheap process. The cargo boats pass many check points along the way, where they are inspected thoroughly. They also pass into Brazil briefly before coming to Leticia, which is on the Colombian side of the border with Brazil and Peru. Leaving the fluvial inspector’s office, I mentally prepared myself to ride to Ecuador instead. Lenin hadn’t given up quite yet though. He had heard that sometimes the cargo boats drop people off before going to the checkpoint to pass into Brazil and then come back to pick up the people to continue down the river. He was still thinking about going anyway, without the fluvial inspector’s blessings. I thought it was too risky and didn’t want to do anything that might get me kicked out of the country or banned from traveling there in the future. 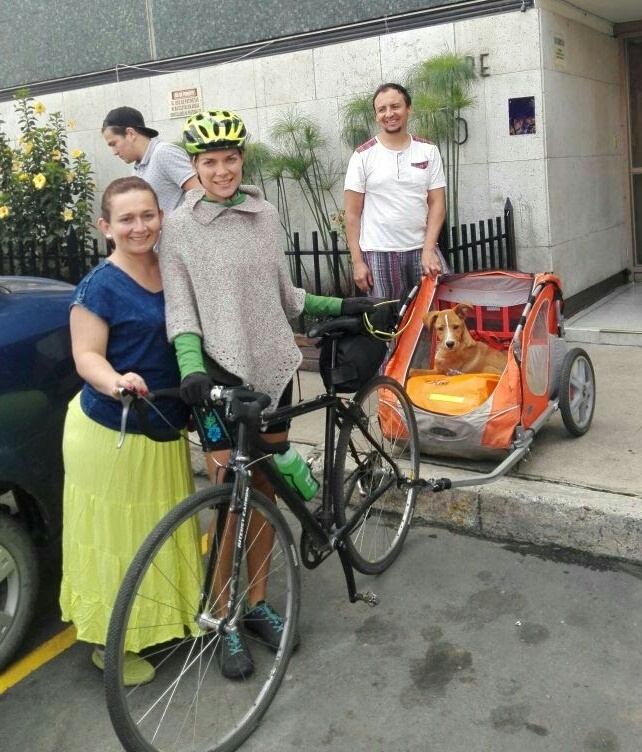 In the end, Lenin was not happy, but we decided to ride to Ecuador. Cabunga was out of town when Lenin and I arrived in Sibundoy, but he gave us directions to get to his family’s house, which was only a few blocks from where the truck had dropped us. Cabunga’s family is indigenous, of the kamsá tribe, and his father is a taita, or tribe leader. When we arrived at the house, his brother and mother greeted us, as well as a golden retriever named Falcón. Benjamin, his brother, was carving a drum out of a tree trunk for the upcoming carnival. He showed us other decorative carvings of animals and faces in various other tree parts. Inside, the house was full of handcrafted indigenous things, including jewelry, musical instruments, bags, and clothing as well as more wood carvings. There were also various animal skins and totumas, a type of gourd or fruit that grows on trees and is used to make bowls and cups. 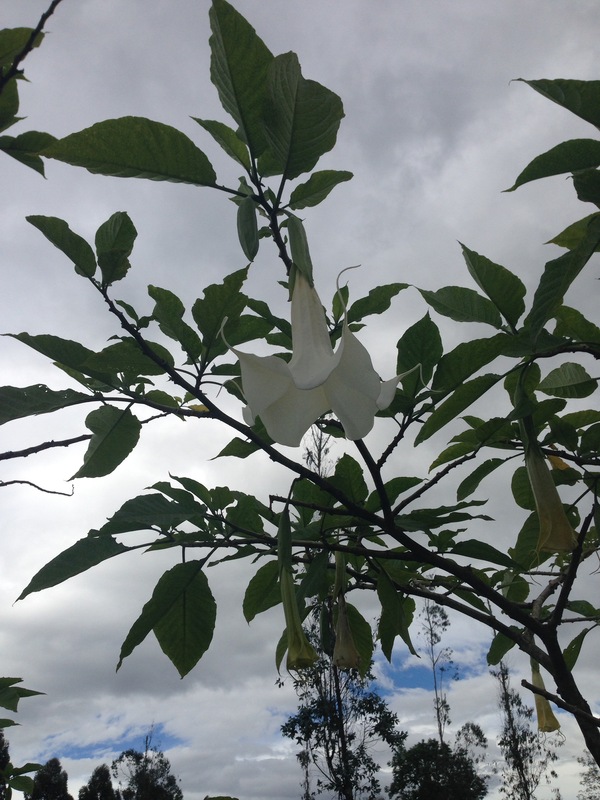 These flowers are beautiful, but dangerous, and they are growing all over this region of Colombia. They have a chemical call scopolamine, which criminals use to make a person suggestive and easy to take advantage of. The chemical, when ingested, inhaled or absorbed through the skin, can cause memory loss and make you unable to resist a robbery. The next morning, Cabunga arrived and told us about his farm not far from where we were. We decided to check it out, but we couldn’t stay very long because our bikes were in Mocoa, and Will had to move out of his house that day. Cabunga assured us that his brother could go get our bikes and keep them at his house in Mocoa, so we could stay as long as we wanted. After a few phone calls to arrange that, we walked to Cabunga’s farm, about an hour down the road. We stopped along the way to buy a chicken, and then at Cabunga’s relative’s house just across the road to drink chicha. Cabunga let the chicken run around with the existing ones in his neighbor’s yard while we passed around a bowl of this fermented corn drink. Once at his farm, we helped Cabunga to fix the wiring on his electric fence. Totally underprepared for this experience, Lenin and I only had one change of clothes and inappropriate footwear. Since Lenin had lost his shoe on the road after Fusa, I had also left my shoes behind in Neiva, so all we had aside from bike shoes were my flip flops and a pair of indigenous sandals made from car tire that Lenin had bought for $2.000 pesos in Santander. I borrowed sandals from Cabunga to walk around the grassy fields, but they were too big, and it was very awkward walking. The fields appeared flat and easy to walk through from a distance, but up close they were full of ruts from the cows, and there was lots of mud hiding below the surface. I didn’t make it out of there clean, but it was a good experience. That night we returned to the neighbor’s across the road to drink more chicha. We sat in a circle, passing around the totuma that someone would refill from a bucket. Every time I thought we were finally done with the stuff, someone would come back with a full bucket. I had no idea where this much chicha was coming from. Somewhere outside, I think. I imagined a huge trough out in the back yard, full of chicha, where someone would dip the bucket in to refill. I’m pretty sure nobody wanted to keep drinking it, but they all felt obligated to keep passing it around and make each other drink. I avoided getting as drunk as everyone else by pretending to drink with everyone, only putting a little bit of chicha in the totuma when it was my turn. Then someone brought out the rum, and things got weird. When it was time to go, Cabunga was passed out peacefully on the floor, and Lenin was in tears, convinced that he had killed him with his mind. Cabunga’s chicken was still in the yard, wandering around and looking for a place to sleep. He kept peeking through the window at us. The three of us eventually stumbled back to Cabunga’s house, where Lenin and I climbed up a ladder to the second level to sleep in a tent. The house is still a work in progress, so instead of beds there are three tents on the second floor, and Cabunga has a tent inside of his room on the first floor. Cabunga had to leave the next day to get his family, who was waiting for him in another town, 8 hours away. 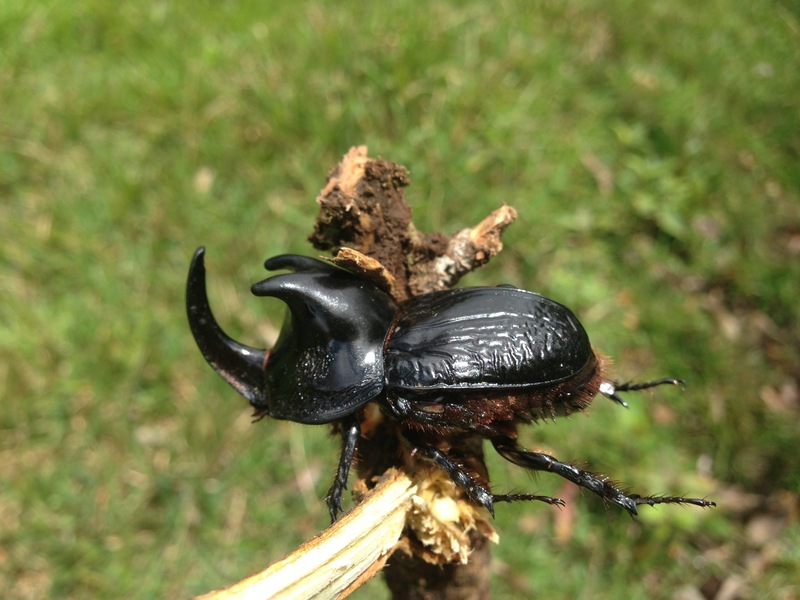 Before leaving, we helped him to fertilize the grass he was growing and relocate some plants. We had wanted to hike to a thermal spring, but didn’t have enough daylight or energy for that, so we extended our stay on the farm an extra day. Collecting milk for morning hot chocolate! The next morning, we woke up extra early to get a chance to milk the cows, which someone comes to do every morning at 6am. I was anticipating the raw milk to taste very farmy, or the way a cow farm smells when you catch a waft of it in the air while passing on your bicycle. The milk was warm, but otherwise didn’t taste any different from regular store-bought milk. Cabunga didn’t have any refrigeration, so we used what we took to make hot chocolate with breakfast. The rest went with the milker to sell at the market. 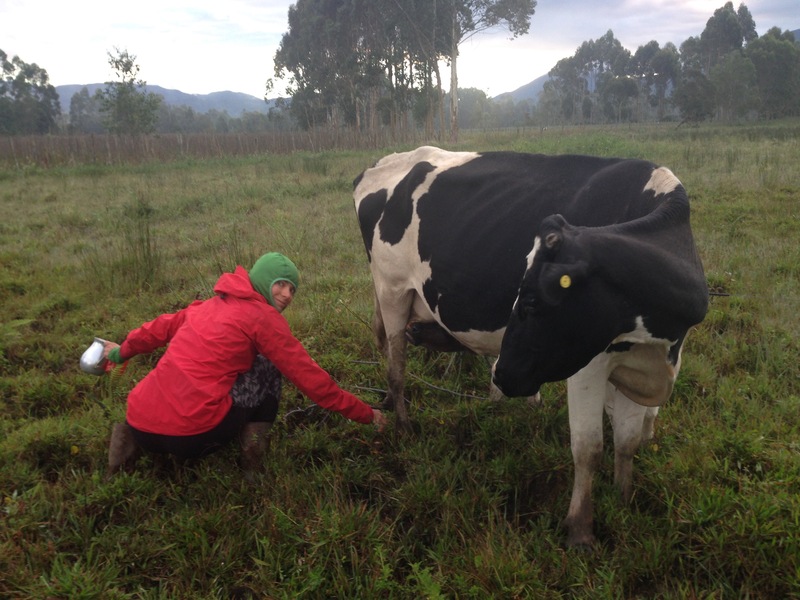 Cabunga only has two cows that produce milk currently, but each cow yields about 20 liters of milk per day! After breakfast, Lenin and I borrowed bicycles to get to the base of a mountain, about 7 miles from Cabunga’s farm, where we would hike up to the thermals. Cabunga had instructed us before he left on how to get to the trail, but we still had quite a difficult time finding the thermals. We were supposed to go just past the yellow bridge and ask for Cabunga’s aunt, where we could keep the bikes while we hiked. We passed at least 4 yellow bridges before we actually came to the right one, and by that point we had asked so many people where the trail was, the last person we asked said we could keep our bikes in their yard. Shortly after entering the hiking trail we passed another couple with a horse. They had never been to the thermals despite living there, but they could give us a detailed description of how to get there, right down to the type of trees we would see before we would have to turn off the main trail. Of course, there were other trails that we kept turning down before we got to the right one, and even then we walked too far along this trail when we were actually supposed to climb back down the other side of the mountain from there. We found two of these along the way to the river. We ended up walking a long way to where the trail dead ended at a gate to a small house. A few dogs immediately came to bark at us, and Lenin called out to see if anyone was there. A few moments later, a very old indigenous woman emerged, hobbling over slowly through her garden and to the gate. This lady gave us instructions to go back and walk down into the valley, but not as far as the river, and then turn left to get to the thermals. She also warned us that we should have a machete or something to defend against animals like wild boar, tigers and snakes. This lady was so old and so slow, I wondered when was the last time she could have left her house to visit the thermals, or to go into town for that matter. She complained of terrible pain in her legs, worse than the pain of having a baby. We shared some of our bread with her before going back on the trail. The trail grew steeper and greener as we approached the river. From the point where we turned off this trail, things got a little hairy. We found some sticks, which we sharpened and carried with us in case we had to fight off any wild beasts. The trail was basically non-existent as we descended towards the river, which we couldn’t see, but could hear as we approached. I began wondering if we should just turn back and give up on our mission to find the thermals, but Lenin was determined, and at this point I think we had gone too far to turn around and admit defeat. We eventually came to a grassy clearing, and we found a more distinct trail from there going to the left. 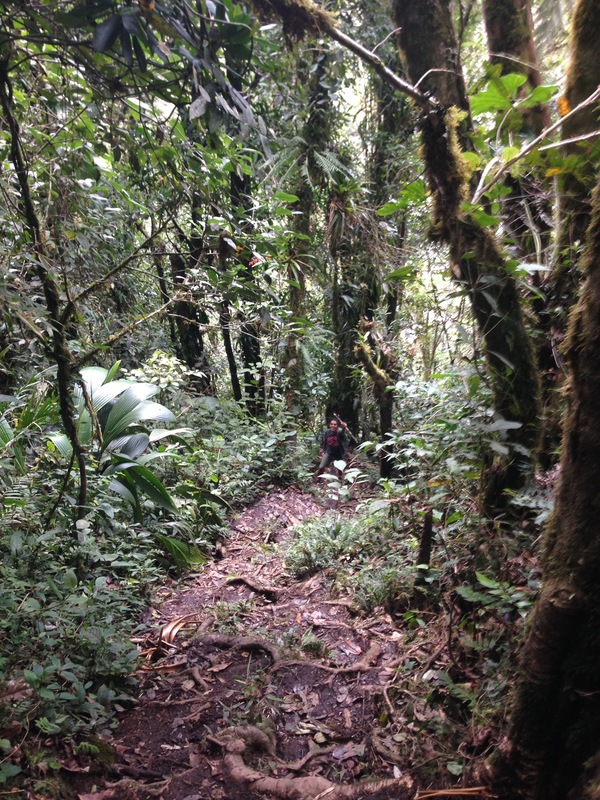 This trail grew very steep, and we carefully climbed down to a river. Thinking it was the wrong river because we couldn’t see the steam at first, we kept going closer. Emerging from the jungle and into the sunlit, rocky riverbed, we saw another small stream on the other side that joined up with the stream closest to us just a few meters down. Then we noticed the steam. It was a warm day, so it wasn’t as prominent, but the stream closest to us was incredibly hot. Just past where the two streams converged was a shallow pool that was the temperature of a hot tub, and immediately beyond this pool the river plummeted about 10 meters or so in a hot cascade before continuing along a shallow slope as a narrow, winding river. Lenin bathes in the hot river. Lenin and I hung out in the hot water for about an hour, ate some snacks, and then hiked back to our bikes. The hike down took half the time that it took for us to find the thermals, but the bike ride back to Cabunga’s farm seemed to take longer. 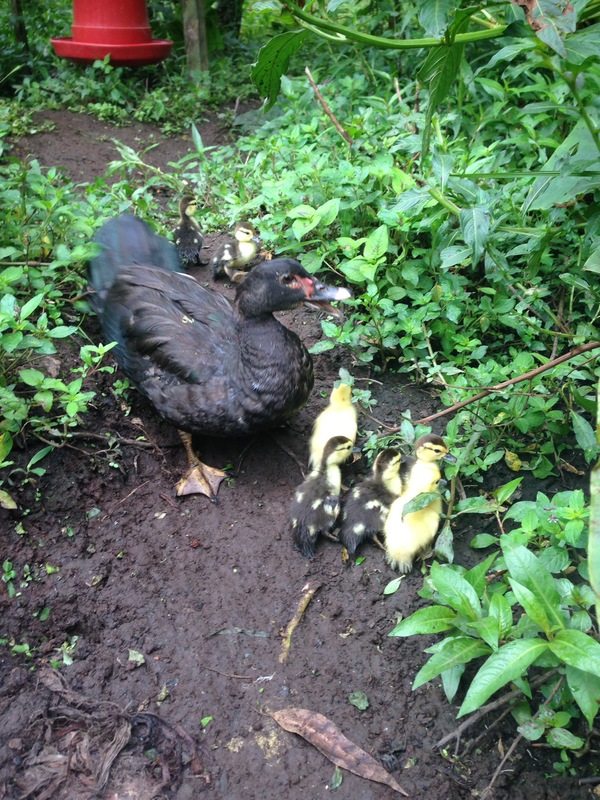 New ducklings, just a day old, waddle around with their mom. During our stay at the farm, one of the ducks hatched 7 baby ducklings. There was still an unhatched egg in the nest two days later, which the mother had abandoned to take care of her other seven ducks. The last duckling had only half cracked his egg, so we helped him along and out of the egg. The mom didn’t want anything to do with him though, and everyone we asked told us that he would end up dying. We couldn’t let that happen, so we brought him with us back to Mocoa. The ride from Sibundoy was a lot faster than the ride there, since we took a passenger van back instead of hitching a ride in a sketchy truck. 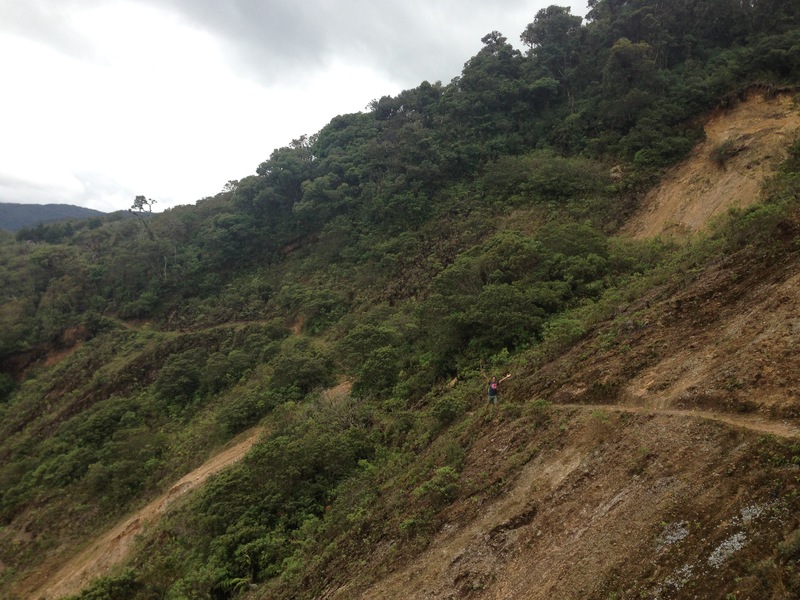 It was still bumpy enough to make me wonder if I was damaging my brain, and the threat of being covered by a landslide was ever looming in the back of my mind. Back in Mocoa, we stayed a night with the person who had taken our bikes from Will’s house and hit the road (with our new duckling passenger) the next morning. As Lenin and I were preparing to leave Will’s house in Mocoa, he told us about this place that’s just a bus ride away and has a very nice lake. We got a late start as it was, but Will said we could get there in three hours, eat lunch and maybe swim in the lake before coming back or spending a night. We left our bikes at Will’s house since we planned to return before he had to clean out his place, and all we brought was a backpack with a few extra layers to keep warm. We were really hungry, so decided to have lunch before leaving. We had set a $30,000 pesos daily budget for ourselves, and the bus to Sibundoy cost $30,000 per person, so we tried to hitchhike first. Eventually, a truck pulled over and told us that we could come for the ride for $15,000 altogether. We accepted. 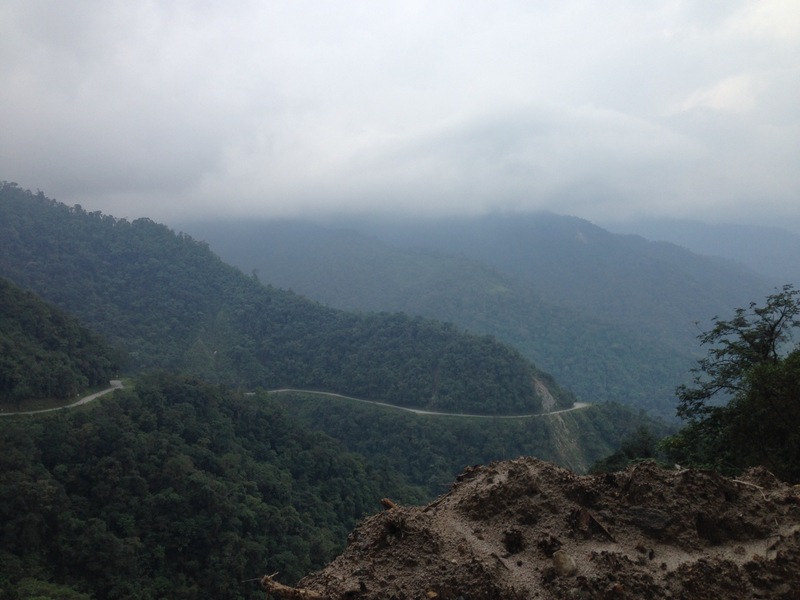 The road between Mocoa and Sibundoy is known as the most dangerous road in the world. This is mainly because of the high risk of landslides, and the high number of people who have died on the road while driving. 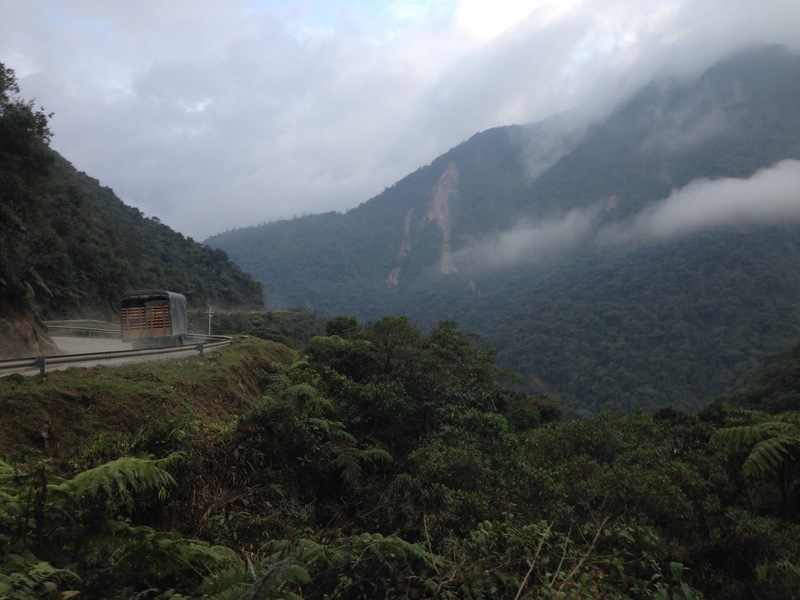 Along the road were signs warning of the landslides in every possible way you could describe a landslide, including “piedras caídos”, “zona geológicamente inestable”, “derrumbes”, “deslizamientos” and even “avalanches”, just in case you didn’t understand one of them. There were no other roads to turn off of this narrow winding road that we were on, and no houses or roadside attractions, but the signs for landslides frequently dotted the long road, as if people would be coming onto the road anew and not know about the hazards, or just in case people forgot and started to feel too comfortable. There were several sections where we crossed waterfalls, water falling onto the rocky road from a sheer mountain wall on one side and rapidly passing underneath us to fall off the cliff on the other side of the road. The truck we were in was traveling with another truck that had two drivers in it, and both trucks were empty in the back. Together, we made three stops in total. One to pick fruit from a tree on the side of the road, the second to light a candle at a Virgin Mary statue on one of the ridges, and a third for coffee and snacks around the midpoint. After the last stop, one of the drivers from the other truck switched spots with our driver so he could rest. Lenin, who was sitting next to him, didn’t notice this switch until we were well into the second half of the ride. It was dark when the two trucks pulled into the town before Sibundoy to load up with cal, or lime. This agricultural product is used to clean the coca leaves in cocaine production. While loading both trucks, our original driver confessed he had forgotten we were in the other truck. Loading took maybe half an hour, and then our original driver brought us the rest of the way to Sibundoy. The drive that we thought would only take 3 hours took more than 7 hours, and we learned that the town was still almost an hour short of reaching the lake that Will had told us about. We had contact info for Cabunga, a WarmShowers host in town, so we decided to try to stay with him and see the town in the morning. 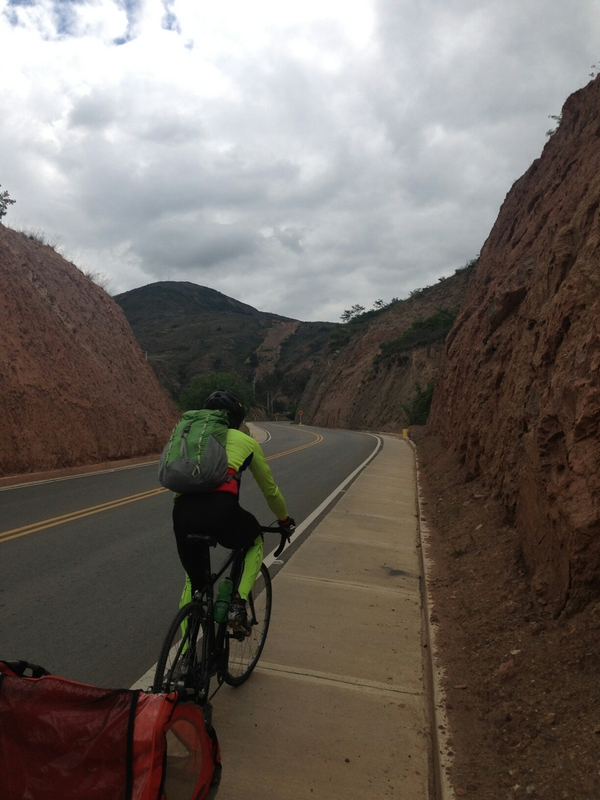 The route from Sopó to Bogotá put us back on the nicely paved road with wide shoulders, and it was predominantly flat the whole way there. 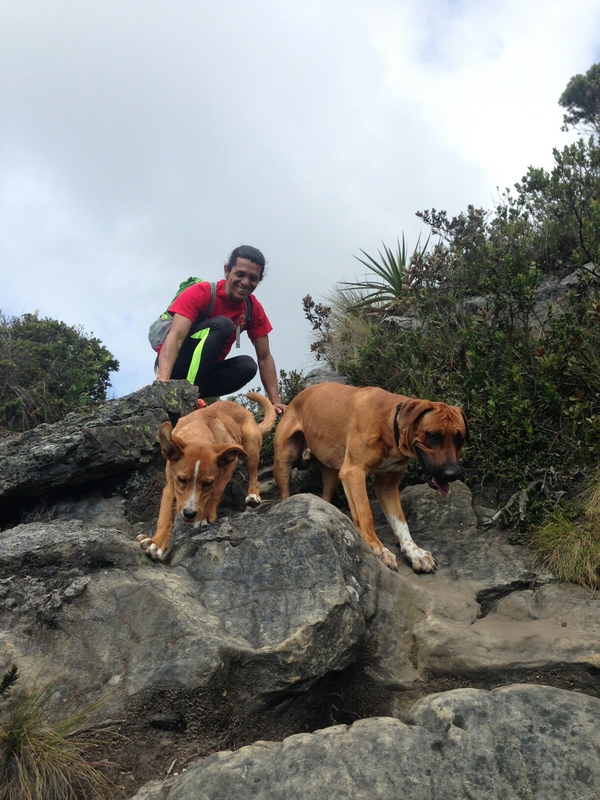 We didn’t have very far to go that day (only 50 kilometers), so we were able to leave Sopó late in the afternoon. I think it was actually after 5pm when we left, so most of our ride was in the dark. After only 20 kilometers we crossed into Bogotá, but it was still another 30 kilometers to get to la Candelaria, where we were staying with Lenin’s former coworker. The traffic in Bogotá was horrible, and we were weaving around the gridlocked cars and buses. 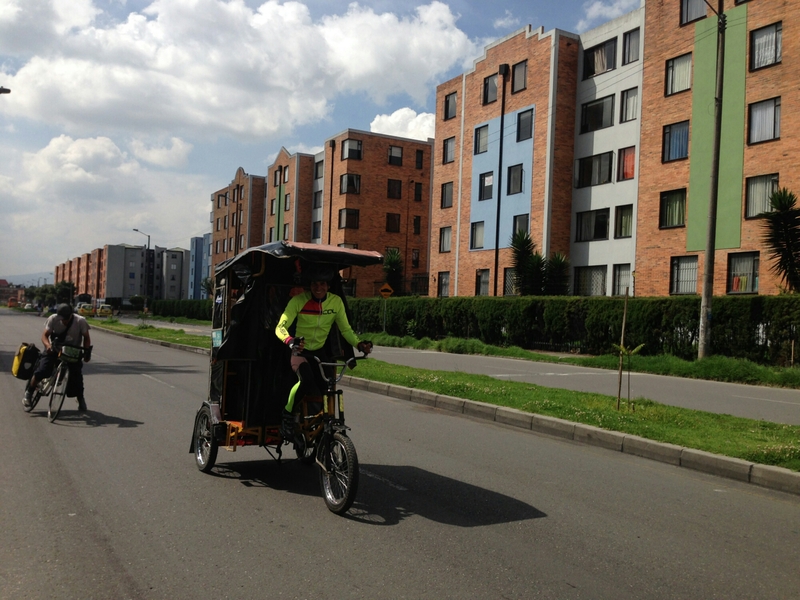 Bogotá is full of ciclorutas, and we rode a few blocks out of our way to get to one of these, but it ended up being faster to ride on the road with the traffic so we went back. We made it to our destination quickly, with no snack breaks and no problems. ​In Bogotá, Lenin and I rested, met up with the French girl who we had met in Villa de Leyva, visited thermals in Choachi, enjoyed the higher quality bakeries in the city (including my friend’s donut shop), and biked to parque Simon Bolívar. We also spent a day walking around, visiting bike shops and talking with the owners. The first and smallest shop we visited was owned by a man who raced bikes in Europe in the 80’s. He gave us coffee and talked for a long time, telling us about the much larger shop he owned a few years ago before robbers stole almost everything he had. Another shop owner and his son told us about how they started the bike polo scene in Bogotá, where everyone began on whatever bike they had. Over time, its popularity grew and people started buying fixed gear bikes more specific to the sport. The guys at this shop build their own bicycles, and they were very interested when we told them about cyclocross. In general, almost none of the bike shop employees knew what cyclocross was. 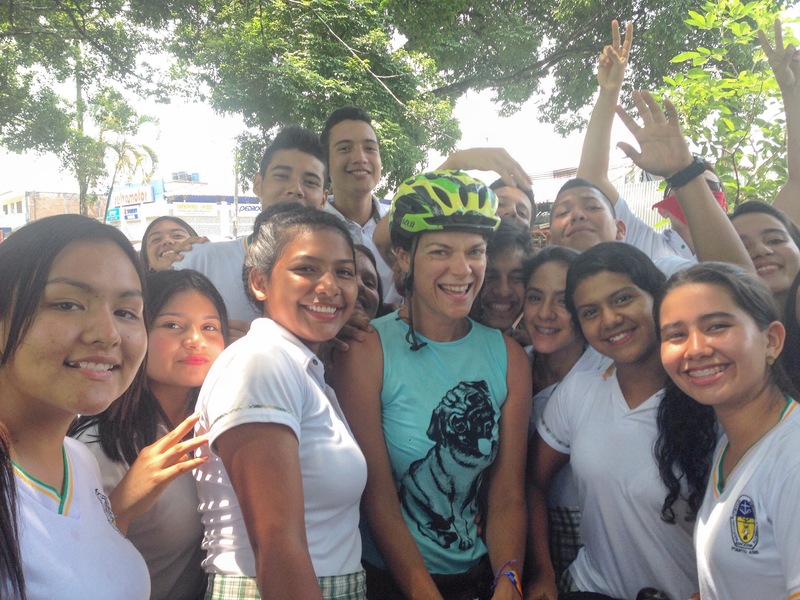 They all though we were talking about BMX at first, which is called bicicross in Colombia. By the end of the day I was so tired of talking to bike shop people and felt so worn out from exercising my brain in Spanish. All I wanted to do was go home and lie down. Churro was clearly exhausted as well, immediately falling asleep on the floor of every bike shop and begrudgingly waking up to move on to the next. None of the bike shops we visited thus far had any cyclocross bikes, and only one of the employees in one shop knew anything about the sport. But then we passed a shop that was actually called Ciclocross, so we had to go in and ask. 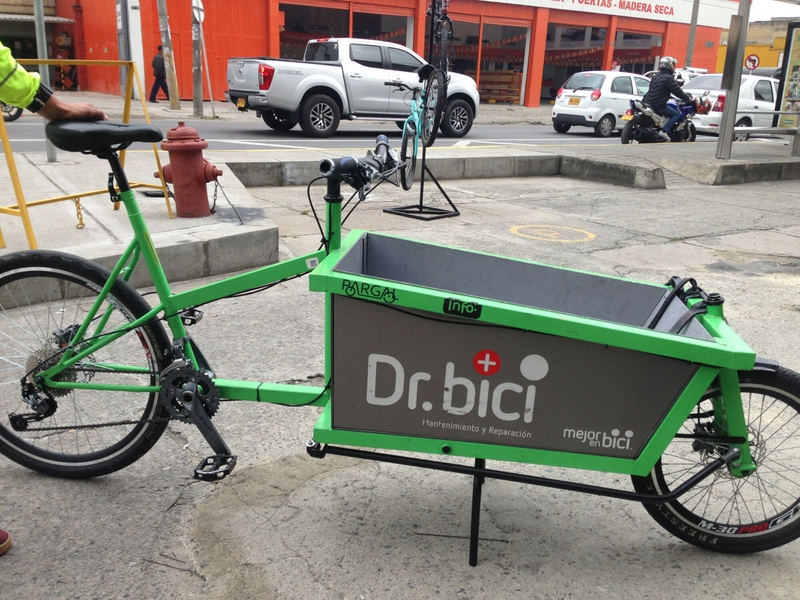 This cargo bike is local to Bogota. We would have liked to try carting Churro around in one of these! ​We walked in, and the first employee we spoke to did what everyone else had done, taking us to the BMX bikes. “No, that’s bicicross! Cyclocross is different!”, Lenin proclaimed, like he had in every other shop. This attracted the attention of another employee, who came over and invited us to follow him into a back room, where he showed us a brand new LaPierre cyclocross bike, still in the box. He said they had already sold over 100 of them. It was expensive, and we weren’t planning to buy a bike, but it was interesting to see what the market was like here. The employee told us that there were a handful of people who were into cyclocross in Bogotá, but most people have no clue what it is. Adriana and her family come out to say goodbye to us before leaving their apartment. ​We stayed several days in Tunja. The first day, after lunch, we drove up to Edna’a uncle’s finca in Combita, where the family there was making pizza. The climate here is on the cold side, and rainy, so after dinner we all went into the sauna and played Cranium while drinking beer. ​On the second day, Lenin called Juan Manuel, and he took us on a bicycle tour of Tunja, which basically consisted of pointing out all of the nine churches in the city. He knew people on every street, and Lenin started calling him “Alcalde”, or mayor. Before going to his mom’s house for coffee and sandwiches, Juan Manuel took us to Nairo Quintana’s apartment building. 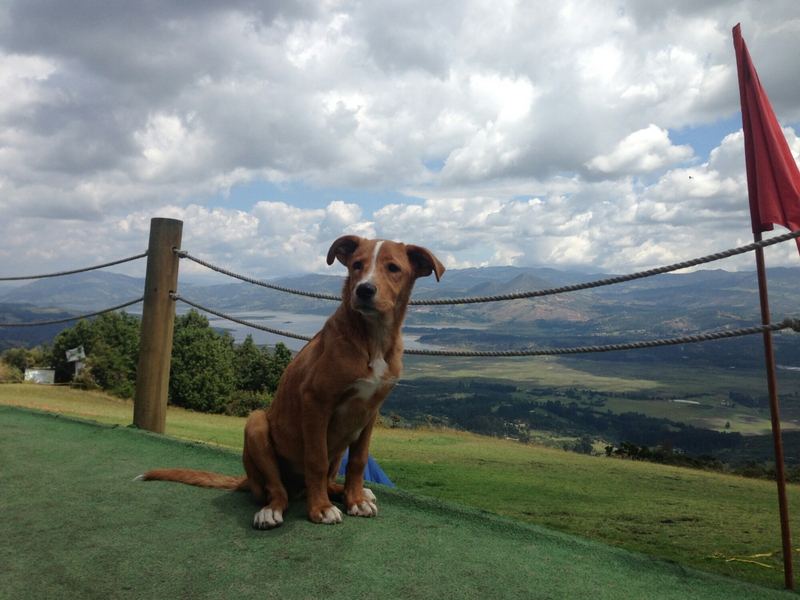 He lives in Tunja, and is very receptive to visitors. However, when we asked the security guard if we could meet him, he told us that Nairo was in Bogotá for a social event. 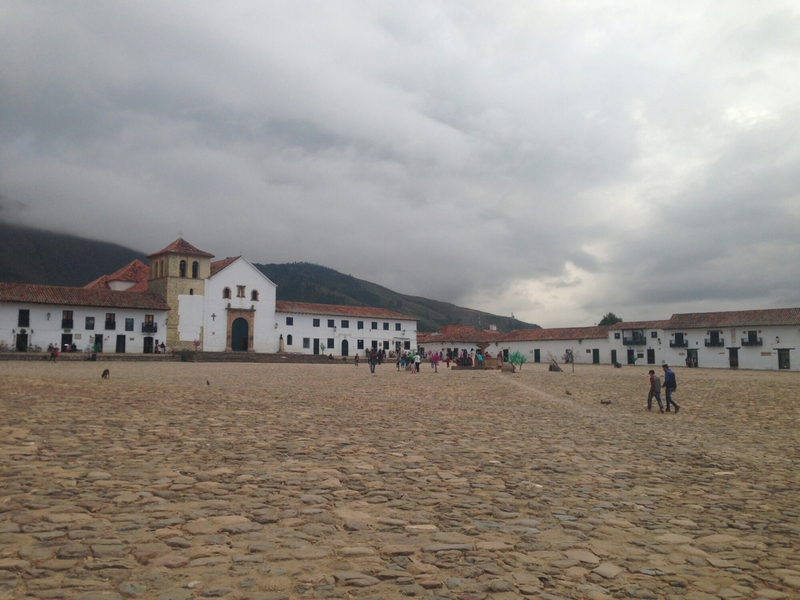 Normally full of tourists, the main square in Villa de Leyva was empty when we visited. ​We made plans to meet again the next morning to ride to Villa de Leyva, the second most touristy city in Colombia after Cartagena. The first ten kilometers was up, but the rest of the ride was downhill or flat, and the climate grew much warmer and drier in a short distance. We arrived before noon in the small town, where the main square and streets were made up of old cobblestones. 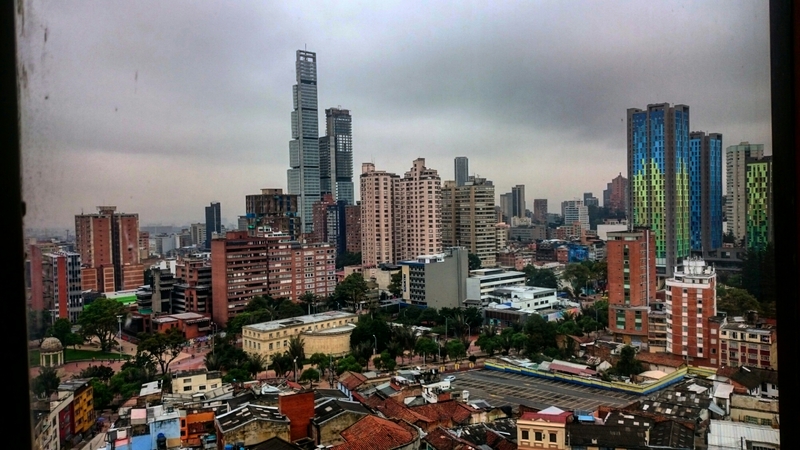 This region is rich in paleontology and archaeological findings, including prehistoric fossils and indigenous ruins, and there are many museums, restaurants, shops and cafes in a relatively small area. Juan Manuel had to work that day, so he took a bus back to Tunja. Lenin and I ate lunch and walked around the town. Down one of the streets off the main square, I found the best gelato I’ve had since arriving in Colombia. Good ice cream is increibly hard to find, although there are many ice cream shops. Nearly all of them offer the same two brands of mediocre quality ice cream. Needless to say, the gelato in Villa de Leyva made me very happy. 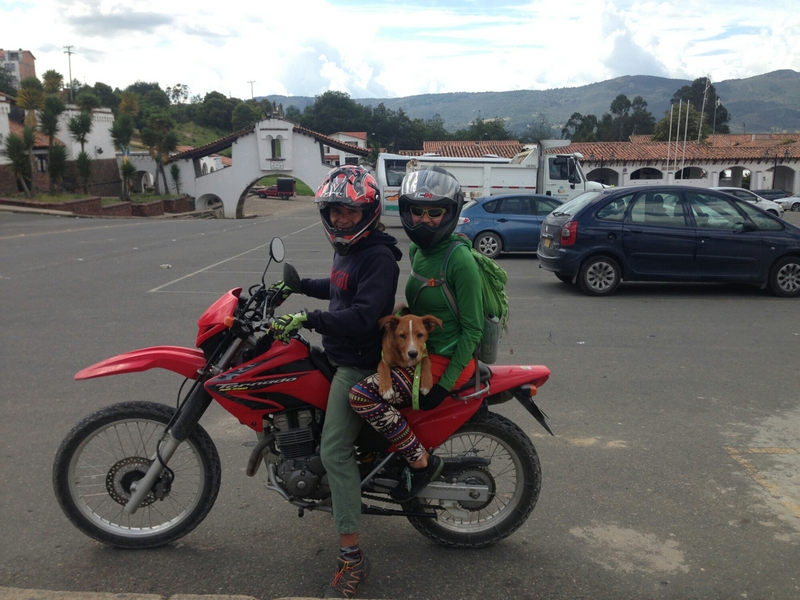 Riding back to Tunja from Villa de Leyva, Churro slept most of the way. 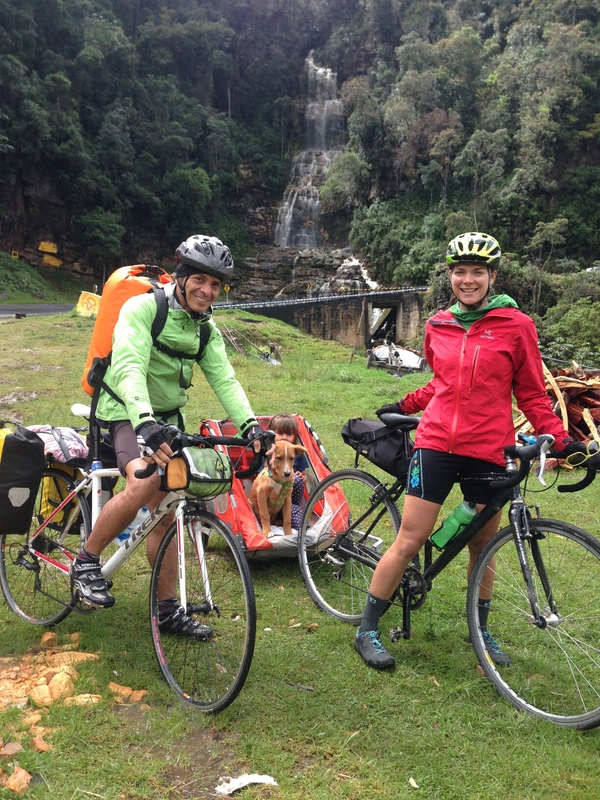 ​We ended up finding a host on WarmShowers at the last minute, where we stayed two nights. There were two other travelers staying there, and we all shared a room. One girl was from France, but living in Bogotá, and the other was from Bogotá. The next day we all walked to the paleontology museum, but it was closed, so we ended up hiking up a nearby mountain instead. The family hosting us was incredibly generous with their space, as every room in the house contained multiple beds, including the kitchen, and it was unclear how many people actually lived there, or whether people had their own bed or just slept in whichever one was vacant at the time. We shared dinner and breakfast with everyone, with the girls from Bogotá cooking dinner and Lenin and I cooking breakfast. Churro made friends with their dog, Dakota, and he did not want to leave when it was time for us to go. 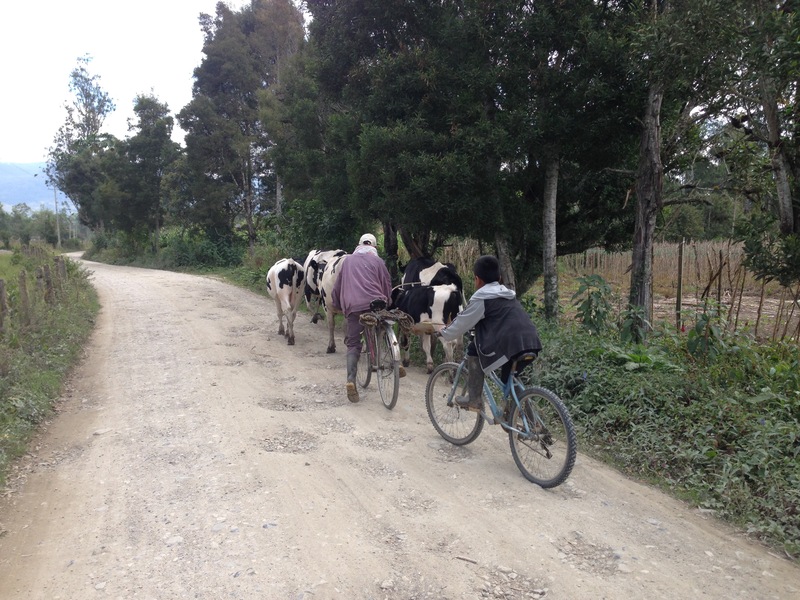 We rode back to Tunja the second morning for one more night at Edna’s house before continuing south. On the way out of Moniquira, we slowly made our way uphill for about an hour before we came across the finca that the tourist policeman had recommend to us the night before. 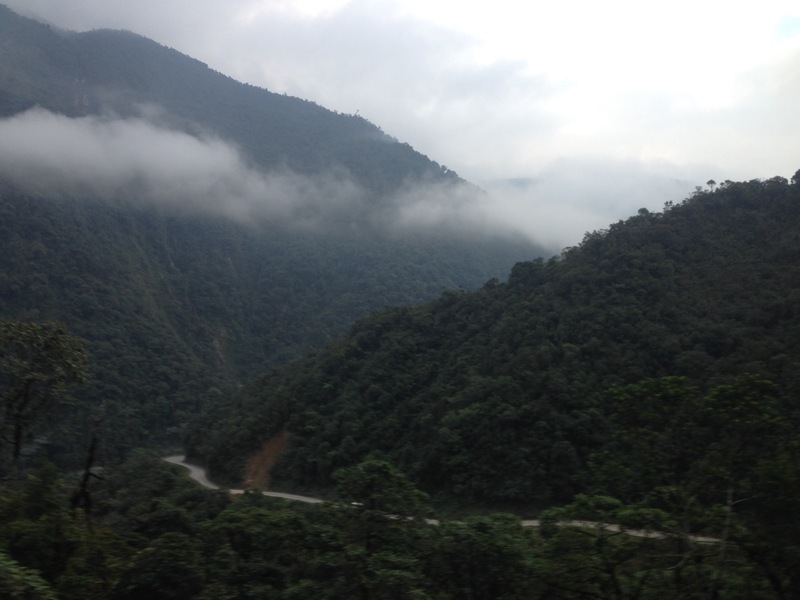 We only had to go about 65 km to get to our friend’s house in Tunja, but there was a lot of climbing, and Churro in his trailer slowed us down considerably. 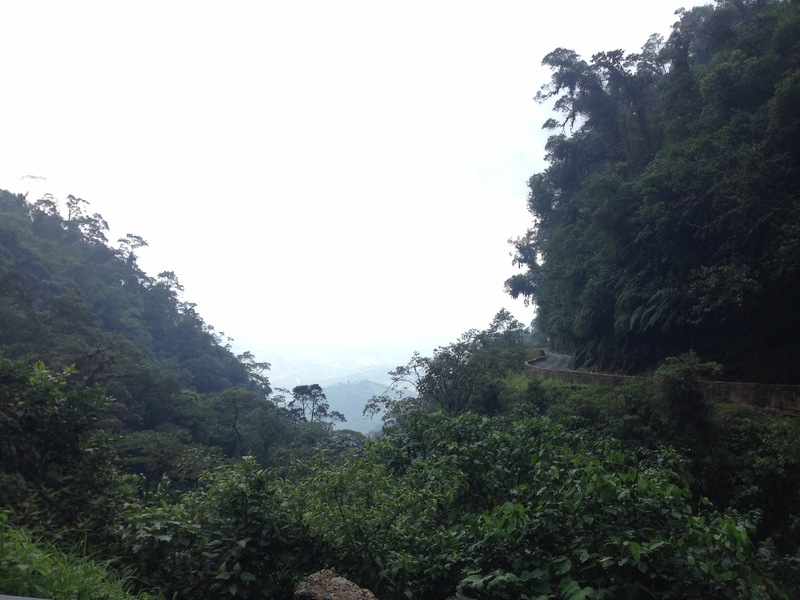 ​We finally started to descend a steep mountain when it began raining. The rain was cold and hard, and the on the way down we passed a magnificent waterfall. Shortly after this, and the only place for miles where one could pull over, was a house that happened to have an amazing view of the cascade. Lenin and I were not the only ones stopping here, as there was another couple on a motorcycle who had also come in to stay dry. The family inside seemed accustomed to frequent visitors, and they made coffee for all of us while Lenin and I changed into dry clothes. Lenin asked them why they don’t have a restaurant or some business there, with the perfect view of the waterfall, but the woman answered that there are too many thieves from Bogotá on the road. After waiting for about an hour, the rain let up enough for us to venture back outside. We continued on to a small town called Arcabuco, where we stopped for lunch. We got inside just a moment before the rain recommenced, this time for longer and harder than the first time. 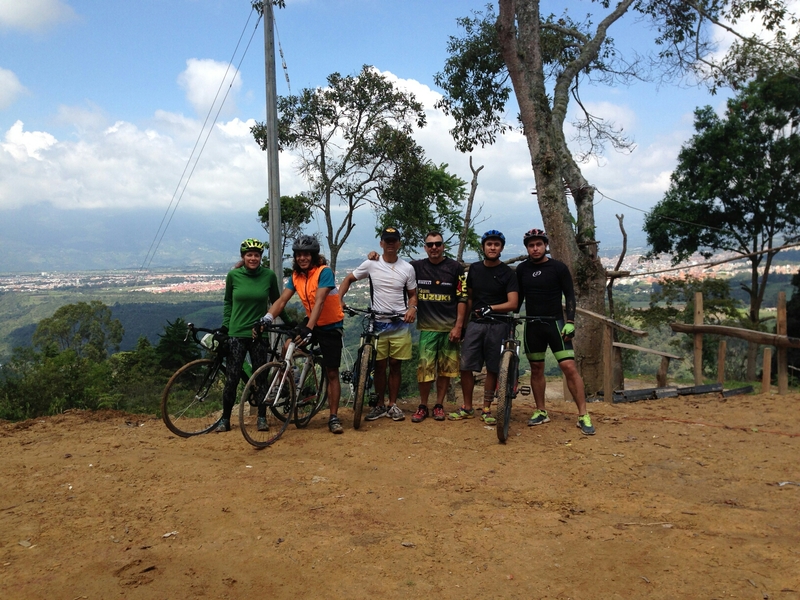 ​The rest of the ride to Tunja was uneventful, until we reached Combita, just 15 kilometers from our destination. The home where Nairo Quintana grew up is on our route, and it has become somewhat of a shrine to the superstar athlete. Nairo’s parents run a small tienda out of the house, selling mugs, shirts, souvenirs, coffee and other snacks. I had been anticipating arriving at this place all day, and it seemed to take forever to get there. The road was hilly, and weather was pretty horrible for cycling, and nobody seemed to know anything about distances or how long it would take to bike somewhere. Seriously, every time we asked someone how far the house was, they severely underestimated either the distance or the time it would take. Anyway, it was dark by the time we arrived at Nairo’s house in Combita, and all I wanted to do was rest inside and recharge. 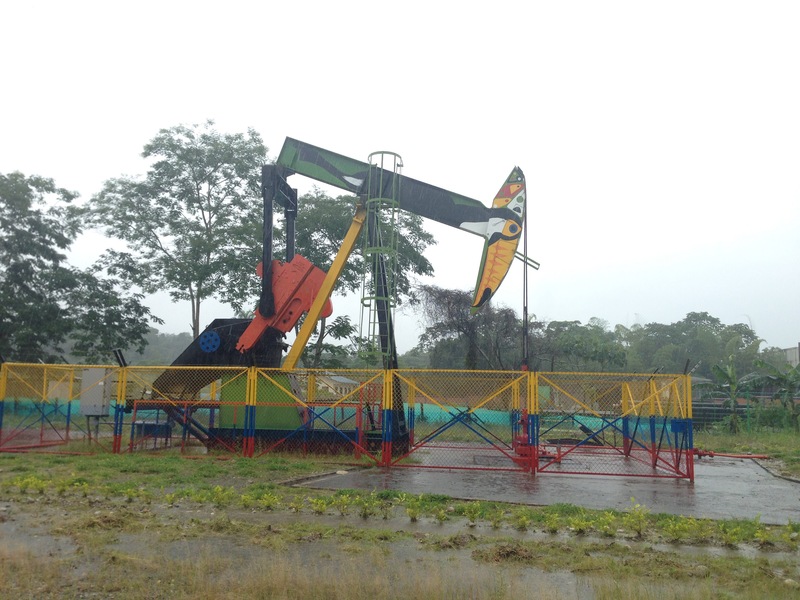 We had already wasted a lot of time waiting for rain to stop, and Lenin wanted to get on the road quickly to get to Tunja. After a quick tinto (black coffee) and brief conversation with Nairo’s mom, we got back on our bikes. It was dark and cold, and from there it was all downhill, so we were going fast with not much pedaling, making me even colder. My front light died almost instantly, so I couldn’t see the cracks in the road. Within the first few kilometers after leaving Nairo’s house, I got a flat tire. I felt like giving up and hitchhiking right then, but we sat on the side of the road in the dark, fixing the flat with frozen fingers. From there, the descent was steeper and the pavement grittier and less consistent. When we arrived in Tunja, Edna was still driving back home from out of town, so we sat at a cafe to pass the time. Two guys came up to us and bought us coffee, actually! They had seen us in Moniquira that morning and wanted to talk to us about our trip. One of them, Juan Manuel, was an enthusiastic cyclist who wanted to show us around the city, so he and Lenin exchanged phone numbers. When we finally met Edna and walked to her house, it was a relief to have a nice place to rest for a few days.